Eight previously uncollected stories, most written in the last ten years, from the author best known for his National Book Award–winning Middle Passage (1990). 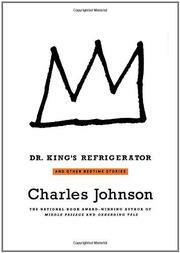 Fantasy appears in the title story, with a young Martin Luther King having a vision of universal plenitude and international charity while raiding the fridge for a midnight snack; in an initially charming fable about a West African king whose artistic creations bring his people prosperity but can’t prevent their eventual enslavement (“The Gift of the Osuo”); and in the story of a liberal corporate executive undecided about whether to offer a plush job to a superbly qualified white woman or to a diffident, stiff-necked—but obviously deserving—black man (“Executive Decision”), a piece that has virtually no development or tension and is characterized thus in the “Publishing History” that follows its text: “Johnson thinks it’s quite possibly the only published short story that dramatizes the issue of affirmative action,” a sentiment either inaccurate, or meaningless, or both. Elsewhere, a coed’s unfortunate romance with an African dignitary’s son (“Cultural Relativity”) takes a hoary Aesopian twist; a Kafkan nightmare overtakes a citizen who has underpaid a new tax levied on dreaming (“Sweet Dreams”); and a one-joke anecdote describes how an insomniac college prof finds a cure for his misery by attending a faculty meeting (“Better Than Counting Sheep”). “Kwoon” is somewhat more substantial, as Johnson enters the thoughts of its two protagonists: a young martial-arts instructor and the hard-bitten ex-merchant marine who nearly kills him during a “sparring” exercise. Yet the story has a tenuous, unsatisfying ending. Far better is “The Queen and the Philosopher,” a witty tale of the 17th-century philosopher Descartes’ debilitating service to Sweden’s Queen Christina, who has summoned him “to serve as her personal tutor in philosophy and mathematics.” It’s inventive, breezy, and not—as Johnson’s fiction frequently seems—inordinately pleased with itself. A dim book not likely to improve its author’s flickering critical reputation.